A physical map of Italy clearly shows that the easiest and shortest route between Florence and Rome would gain from running through the valleys of the rivers Arno and Tiber and the so called Val di Chiana, a depression between Tuscany and Umbria. The Romans however discarded this option and linked Rome to Florence through Via Cassia, which crossed a hilly and even mountainous region. They did so because Val di Chiana and to some extent the Tiber valley were subject to floods and for this reason were marshy in some areas and pretty unhealthy. In the XVIIIth century and in a more decisive way in the next century the marshes were reclaimed and the flow of the Tiber brought under control. So the layout of the XIXth century railway line did not need to climb the hills of Southern Tuscany, but followed the three valleys. In the 1960s a highway called Autostrada del Sole (Sun Highway) linked Milan to Rome and Naples, via Florence and its layout was parallel to that of the railway. There are no major towns in the section of the Tiber valley north of Rome, but only fortified villages, so that when you reach Rome via the highway you see, on the top of the hills, towers and small castles, and you feel that they are sentinels reporting your arrival at the Eternal City. The easiest way to visit these small towns (starting from Rome) is to follow Via Flaminia, reach Prima Porta and then turn right on a road which runs over the hills next to the Tiber and is therefore called Via Tiberina. The layout of old Fiano shows a pattern which is common to all the locations shown in this section: there is only one fortified access to the town which is located on an elevated position which in general did not require additional defensive measures. Most of the towns belonged to the Orsini family, but were sold to other Roman families in the late XVIth century (the image used as a background for this page shows an Orsini coat of arms in the main church of Fiano). The medieval fortress of Fiano was embellished with two fine Renaissance loggias and a pensive garden; clearly the lords of Fiano lived there. The Orsini have left many signs of their long stay, including two small bears resembling a modern cartoon. In 1690 the fief of Fiano was acquired by Pope Alexander VIII, who gave it with the title of duke to his nephew Marco Ottoboni. The Roman family palace of the Ottoboni in Via del Corso was usually called Palazzo di Fiano. A stroll through the streets of Fiano shows other aspects of the past, including ripe pomegranates. This fruit was very popular in the past and because of its many allegorical meanings, it appeared in a variety of paintings: in the hands of an Austrian emperor to represent the diverse nations united by the empire or in that of Infant Jesus as a symbol of chastity and resurrection. The reference to St. Paul in the name of this small town is not due to religious fervour, but to the fact that Civitella belonged to Monastero di S. Paolo fuori le Mura. The fortress has almost entirely retained its medieval appearance without Renaissance gentler additions. A drawbridge was for centuries the only access to the fortress and the town. The decoration of the gate is rather recent (XIXth century). The courtyard of the fortress is a sort of open air museum showing ancient Roman reliefs and inscriptions together with symbols of St. Paul. Civitella retains some very picturesque medieval corners. Nazzano is located on a hill directly overlooking the highway and even the most absent-minded driver cannot fail to notice its elegant tall fortress. Here again there is only one (fortified access) to the minuscule town and a drawbridge led to the fortress. Nazzano belonged for centuries to Monastero di S. Paolo fuori le mura. Nazzano enjoys very fine views over the many twists and turns of the Tiber. At the foot of the hill Nazzano had a small river landing point from which in the past vegetables and fruit were shipped to Porto di Ripetta. 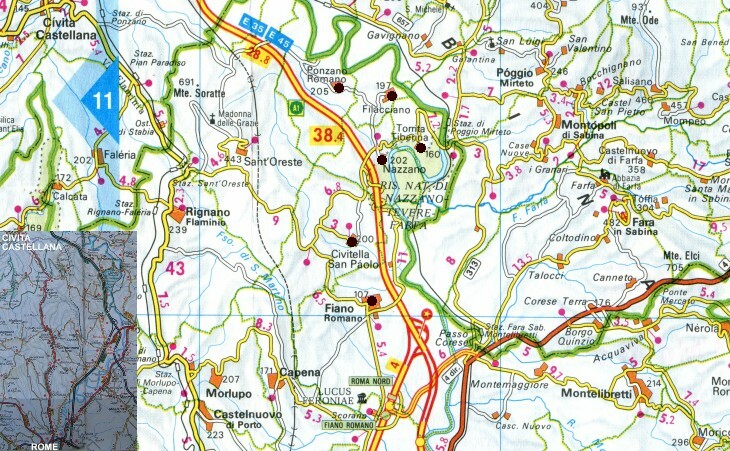 Move to Torrita Tiberina, Filacciano and Ponzano.